St. Louis County Library partners with a number of community organizations to provide innovative programming and services. Some of our current partnerships are listed below. If your organization is interested in collaborating with SLCL, please call 314-994-3300. St. Louis County Library and the Aging Ahead offer Choice: Healthy Living for Seniors programs and lunch for older adults at multiple library locations. Programs cover a wide range of subjects of special interest to older people, including health and wellness, nutrition, scam prevention and retirement. Aging Ahead offers transportation to and from the programs. A current list of programs can be found at www.slcl.org/events. St. Louis County Library collaborates with the Alzheimer's Association, St. Louis Chapter to provide education on various aspects Alzheimer's disease and dementia. Programs include Exploring Alzheimer's, large-format programs offering expert panels, documentaries and guest speakers and Coffee & Conversations, small-group educational programs led by Alzheimer's Association. The Born to Read program provides every baby born in St. Louis County with their first library card. 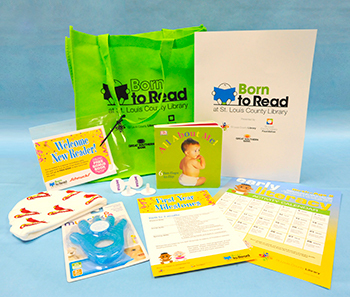 partners with 17 area hospitals and clinics to provide library goodie bags to new parents. Each bag contains a book, a bath toy, information about infant development and a library card. Parents also receive an invitation to celebrate their child’s first birthday at the library where they will receive another free book. Support for the program comes from the St. Louis County Library Foundation. SLCL is one of 57 library districts selected to participate in the White House ConnectEd Library Challenge. The project's goal is to make sure every child enrolled in school receives a library card. SLCL has distributed over 28,000 library cards to area students at nine school districts since accepting the challenge in the fall of 2015. SLCL will continue to expand the program to other St. Louis County school districts in the coming years. SLCL and Gateway Greening work together to create community gardens at library branches throughout St. Louis County. Local gardeners and Gateway Greening volunteers assemble raised garden beds in early spring. The gardeners choose what to sow and tend the beds from planting to harvest. Gardening programs are also offered throughout the year in conjunction with the partnership. St. Louis County Library partnered with the University of Missouri Extension, the Missouri Small Business Technology & Development Centers, and the Small Business Administration to offer a monthly program called “Mind Your Business: A Small Business Lecture Series.” The lecture series started in September 2012 and was designed to reach out to small business owners, entrepreneurs, and individuals thinking about starting a small business in the St. Louis area. SLCL partners with Operation Food Search to provide free lunches during the summer months. The program offers a nutritious meal along with activities for kids five days a week each summer. The free lunch program helps combat hunger, and also works to prevent the summer slide–by introducing kids and families to library resources. In 2016, over 12,000 free meals were distributed. Recycled Reads takes surplus library materials and gives them another life by circulating them throughout the community, encouraging people to read while they wait. Displays are set up at over 60 locations throughout St. Louis County where people typically spend time waiting including St. Louis County Government offices, laundromats, hair/nail salons, health care providers, auto care shops and more. SLCL joined the Safe Place program in September 2014. All 20 branches of St. Louis County Library are designated Safe Places. The designation allows a young person in crisis to begin the process of receiving help at any SLCL branch. Safe Place is a national program that uses volunteers to assist young people in crisis and to provide immediate assistance. Those in need can contact a library staff person, who will then contact a trained Safe Place volunteer. The St. Louis Astronomical Society and SLCL joined forces in 2014 to start a telescope lending program. SLCL has 35 telescopes available for check out by the public. The cope comes with tools, instructions and hints on where to look for various constellations. Volunteers from the St. Louis Astronomical Society help assemble the scopes and make them more durable for patron use. The group also presents star parties at several branches to show how the telescopes work and to help area residents learn more about objects in the night sky. SLCL began offering a series of informal science talks in 2015, featuring local scientists and engineers discussing important scientific discoveries and breakthroughs taking place in our community. Science in St. Louis is a partnership between SLCL, the Photosynthetic Antenna Research Center (PARC)*, Washington University’s Gephardt Institute (under a St. Louis Project Grant), and The Academy of Science of St. Louis. SLCL is a partnering organization with Turn the Page STL, a city-county wide initiative that works to ensure all children in the St. Louis region are reading at or above grade level by the end of third grade. All SLCL locations create a monthly book display based on Turn the Page STL calls to action, encouraging parents and caregivers to read with their children. SLCL continues to work with Turn the Page STL to support early literacy throughout the region. In 2016, SLCL began a partnership with We Stories, a local non-profit helping parents initiate conversations about race using children's literature. All SLCL branches feature a We Stories collection of culturally diverse children's books. In addition, six SLCL branches offer We Stories book discussion kits. The kits include 4-6 different books, interactive activities and a discussion guide. Each kit is centered on a different theme such as, "Everybody Counts," "Girl Power," "Celebrating the Skin You're In" and "Who are the People in Your Neighborhood."